Scottish deerhound as the name suggests, is a sight hound which hunts and bring down deer. The dog is lovingly called “Royal Dog of Scotland” because of its noble bearing and affectionate nature. It is muscular animal with athletic nature which is the best choice of pet for active owners. Once its exercise needs are fulfilled, the dog doesn’t mind being a couch potato and relaxing inside home. The best quality that makes him perfect pet dog is its sweet and even temperament. The dog is amicable towards every human whether it is his own family members or strangers. Because of this nature, it is not a good watchdog. Around children they tend to be soft and docile in nature. They also love to be their playmate. The dog is not suitable for apartment living because of their giant size. They thrive well in yards and farms. People get intimidated by its giant size but this dog is lovable enough to pose any threat. It is also suitable for novice owners. They are ancient Scottish breeds with no records of their origin. 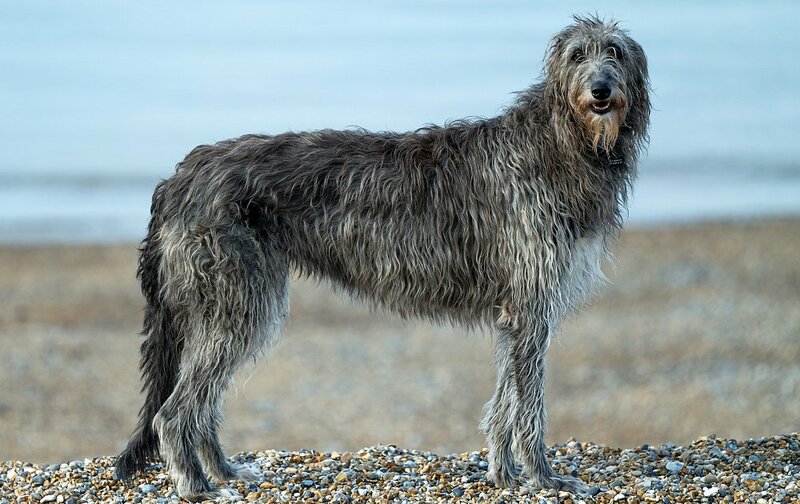 Early name of the breed was simply deerhound. Primary job of the breed was to hunt red deer through coursing. It is believed that this breed shares the same bloodline as Greyhound and Irish wolfhound. With the introduction of gun, this breed’s role in hunting declined. People started using track dog to find wounded animals so that they can easily kill them. Price of the breed is $1000 to $1200. It is a tall dog with muscular build up body. Its head shape is slender with blunt muzzle that gets tapered at the end. Nose is of black color but blue colored nose on blue dog is permissible. Eyes are deeply set and are incredibly expressive. Neck is long, muscular and graceful. Tail is long and has slight feathering. Ideal height of the male breed is 30 to 32 inches while that of female breed is 28 inches or above. Weight of the male breed should range from 85 to 110 pounds. Female should weight around 75 to 95 pounds. The dog possesses a wiry coat which is 3 to 4 inches long. Its coat is harsh, coarse and crispy to touch. This kind of coat gives it protection in the rough terrain of Scotland while hunting. The breed also possesses eyebrows, beard and moustache. The hair of the head and under belly is much soft to touch. It comes in generally dark blue-grey colors. Other colors like brindle, fawn, red, saddle, yellow are rare. White markings on the chest and legs are permissible. Personality – It is described as perfect choice of dog for owners who are novice and leads an active lifestyle. The dog is affectionate and polite to every human being. It will welcome guests and strangers by wagging its tail. The dog will never bark at new person but this doesn’t make them a watch dog. It is well behaved dog inside home. Regular exercise is necessary so that it remains fit. Behavior – The dog has a strong prey drive. It will definitely chase small animals. However with pet of its own size and medium size are safe around it. It thrives in multiple pets home. Around children they tend to be patient and happy to be their playmate. A bored dog can chew your shoes and leather objects. Once its exercise regime is finished, the dog will happily become a couch potato inside home. Activities requirement – The stamina and endurance of the dog is remarkable. Take your dog on long walks and running. Though they have moderate exercise requirement but they should be given opportunity to do physical activities daily. They are not suitable for apartment dwellers because they need space to wander and open them. You can also take your dog on hike and adventure tours. Dog activities which require stamina should be provided to it. Trainability – Patience is the key in training it. Comparatively they are easy to train. Some dogs can be stubborn and willful but treats and appreciation can lure them to learn the tricks faster. It is advisable to never treat your dog harshly and cruelly as that can affect its mental development. Even the stubborn deerhounds are not destructive and ill mannered. The dog requires premium quality nutrition to stay healthy. It should be fed 250-300 grams of meat per day which should be supplemented with vegetables, flaxseed and fish oil. The dog loves fruit and considers it as a treat. Carrot, beans and cucumber are great for dogs. It lives up to 8 to 11 years. It is not a hypoallergenic breed. Health concerns of the dog include- bloat, osteosarcoma, cardiomyopathy and pyometra. Its wiry coat sheds throughout the year. Regular brushing will remove dead hair, and protect hair from getting tangled. It will also remove debris and mats. Bath the dog as needed. Clean its ear with vet approved solution. Trim the nails monthly if they make sound while hitting on floor. Brush its teeth daily to avoid dental health issues. The dog enjoys cold weather. They love to romp in snow. Their coat even enables them to survive in moderate hot weather. They are not suitable for apartment dwellers because they need space to open themselves. Confining it to small house is like restraining its movement which is cruelty to animal. House should be accompanied with yard so that dog can live happily. The dog is suitable for multiple pets at home. They have high pet drive and cannot resist themselves chasing small animals.